It had been a long time since I last attended a family reunion. My impression of family reunions was of genetically connected people who have perhaps never even met gathering together and pretending to like each other, when they might not. Why human beings deliberately torture themselves in this fashion seemed beyond my comprehension, but there must be something to it because we've been hosting these things ever since Caveman Zug invited his uncle Zoog over to the waterhole for a Mammoth roast. It turns out I was wrong about family reunions. I just got back from one, and upon further review I really do love those folks I became reacquainted with after so many years. Age has mellowed the zeal of my youth, and made me realize that petty bigotries and superficial differences in religious and political viewpoints cannot overcome the sacred blood bonds of the tribe. Each one of us springs from a rich bed of biological compost in which an individual's roots are intricately interwoven with those of others. It has taken me a long time to realize this, but we uproot ourselves at our own peril. The reunion of which I speak was attended by the descendants of my maternal grandmother, who had seven brothers and sisters. That bunch has definitely been faithful about obeying the their beloved Bible's command to be fruitful and multiply, and they now number approximately 150 descendants, even though only one of those original eight siblings survives. The family hails from a decidedly arid patch of farmland in central New Mexico, a region that just this year emerged from a decade of crippling drought. Indeed, it was drought that dispersed the family to the four winds back in the 1940s, and drought and the threat of drought has been the predominant theme in the lives of people that have inhabited this locality for hundreds of years; long before my people of Northern European ancestry arrived. Thankfully, many of those among my uncles, aunts, great uncles and aunts, cousins and first cousins once and twice removed are of the curious sort like me, so we took a break from catching up on family events for a little tour of a local Indian ruin named Quarai. 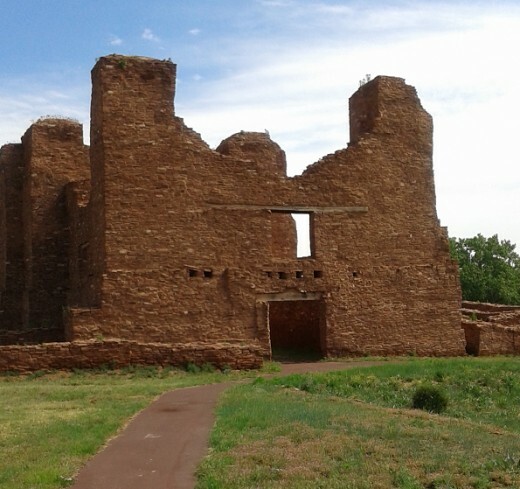 Quarai is one segment of the Salinas Pueblo Missions National Monument, which consists of three separate components, the other two being Abo and Gran Quivira. My family members and I walked about this tranquil locale glorying in the fleeting greenery that seems so conducive to life, while knowing that when cursed with drought the same landscape reverts to an inhospitable, almost impossible place to support the blessings of family; both for newer families that have worked this bipolar soil in the last 80 years, and for families that called it quits and departed four centuries ago. This is the story then, of the old ones and the relatively speaking newbies who have now joined ranks with the ancients and given up the thankless, hardscrabble, dry land farming this land requires in exchange for easier ways to make a living. 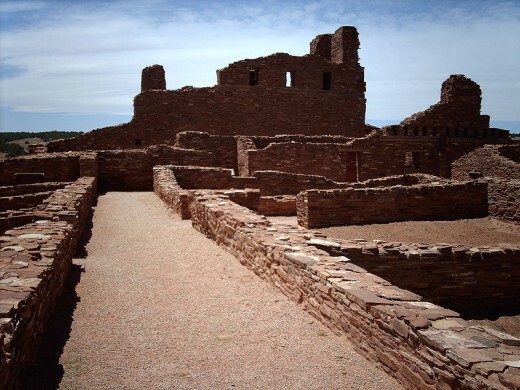 By about 900 AD villages were already established in the area of the Salinas Pueblos, although the multi-room pueblo structures they are famous for were only constructed around 1300, their architecture probably influenced by the Anasazi culture of the four corners region of Arizona, Utah, New Mexico and Colorado. The Tiwa and Tompiro speaking Puebloans of the Salinas Missions Pueblos constructed dwellings that housed at least several hundred people at each locale, and collectively numbered in the thousands. When the Spaniards under conquistador Juan de Onate were finally able to penetrate the region at the turn of the 16th and 17th century, Spanish friars dedicated to christianizing the pagan natives converted the pueblo villages into missions; overseeing the construction of the impressive stone churches that, though crumbling, still tower tall and imposing above the ruins of the three villages. Under the tutelage of the padres, the missions became a trading center between Great Plains tribes and the larger Pueblos of the nearby Rio Grande valley, a bartering network whose still visible wheel ruts were mapped out by my uncle when he was an employee of the National Monument. Inevitable drought and hostile neighbors eventually triumphed, however, and the three Salinas Mission Pueblos were completely abandoned by 1677. Life for the Spanish and Mestizo settlers who supplanted the natives did not get any easier under the eternal cycles of comparative greenery and desiccating drought that has always been the region's prevailing theme. Enormous land grants were bequeathed by the King of Spain to some of the notable Spanish conquistadores who helped placate the province, and these huge tracts of land were largely given over to sheep grazing. The extreme aridity of the locale, however, coupled with savage raids by the Comanche, Apache and Navajo tribes made simple existence, much less prosperity, a tenuous proposition. Mexico eventually replaced Spain, then the treaty of Guadalupe Hidalgo ending the Mexican American War made the United States the nominal overlord of this expanse of Central New Mexico, but change of ownership didn't put an end to any of the endemic problems. Hostile native bands still marauded, and it wasn't until just before the turn of the 20th century that the restless Apaches and Navajo were finally pacified and English speaking homesteaders began to arrive. 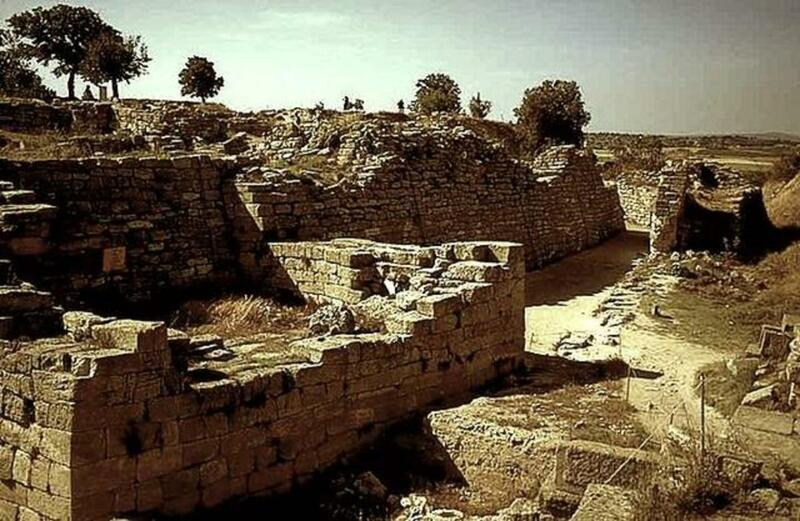 My family's ancestral town of Mountainair, whose very appropriate slogan is "The Gateway to Ancient Cities," lies in the center of the three ruins that comprise the Salinas Mission Pueblos. This tiny burgh of about 1,000 inhabitants was founded in 1903 and for a time was a prosperous, bustling farm community with the prestigious nickname of "The Pinto Bean Capital of the World." 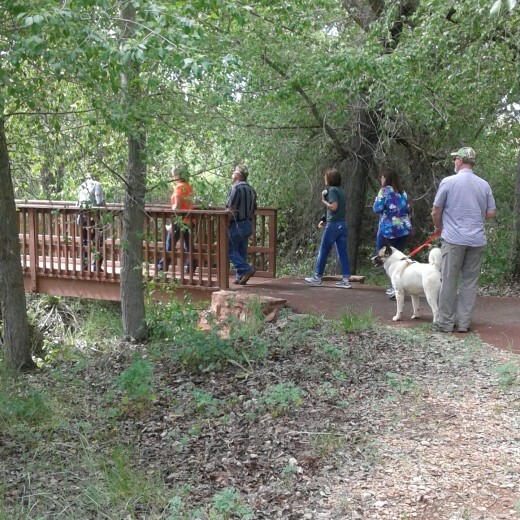 This sobriquet may have represented a bit of fanciful hyperbole on the part of its dreamy eyed, grandeur chasing citizens, but there is no doubt that the homesteaders recognized the long standing Puebloan idea that, as long as the water held up, the area was highly productive for bean farming. The problem was that the water didn't always hold up, as my ancestors on my Mother's side found out the hard way. My Mother's Paternal Grandfather laid claim to a section (640 acres) of very dry farmland about 20 miles from Gran Quivira to the south and Quarai to the north, and it was there that Mom and her two brothers grew up. It was a harsh existence that involved hauling drinking water from Mountainair once a week, since a well drill would only spout water after about 500 feet of rough cutting through rocky substrate, and then it was mostly undrinkable, mineral clogged "gyp" water that would bubble upward. Even so, the crops grew well for a time and the family managed to live off pinto bean profits until the latter part of the 1940s, when they joined the ranks of the Tiwa and Tompiro speaking Puebloan predecessors in fleeing drought for the well watered comforts of nearby Rio Grande Valley communities. It wasn't just scarce, unpredictable water that the ancient and modern peoples inhabiting the Salinas Pueblos region so desperately coveted; but surprisingly they also eagerly pursued salt, a substance that seems to be the very antithesis of water. Seems like we all take salt for granted these days; our food is loaded with sodium chloride whether we like it or not, and if we ever feel the peculiar urge to shake even more of these ubiquitous white crystals over our already salt saturated foodstuffs, it's just a question of picking up that friendly blue cardboard cylinder of Mortons at the supermarket. Believe it or not, there was a time when salt was not so abundant or easily obtained, and because this life sustaining electrolyte was revered in centuries past rather than reviled as it is now, in many cultures there was an air of religious mysticism associated with it. If you like to read thick Russian novels, as I do (which is why I'm no fun on a date), you might be acquainted with the custom of Russian villagers greeting guests with a ceremonial gift of bread and salt. This custom, which is still observed today, was undoubtedly a recognition that both of these substances are indispensable, life sustaining blessings. 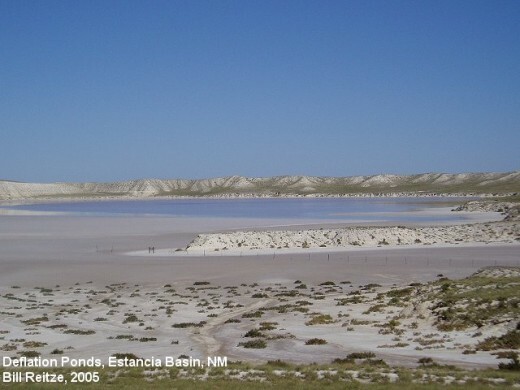 An enormous ibody of water called Lake Estancia once filled the floor of the Estancia Valley, a few miles east of the Salinas pueblos, during the last ice age. This glacier-filled reservoir occupied approximately 300 square miles, but as the ice receded there was no longer a source of renewal or a drainage outlet, so the result was the brackish salt flats that still exist there. These playas, as they were dubbed by the Spanish, were utilized by the ancient peoples of the Salinas Pueblos and also by my own kinfolk. They left their mark in the "Salinas" name of the Monument, which roughly translated means "salt marsh" or "salt flats." Salt was so profoundly sacred to the inhabitants of Gran Quivira, Quarai and Abo that elaborate religious rituals in celebration of the "Salt Mother" were conducted prior to its gathering. 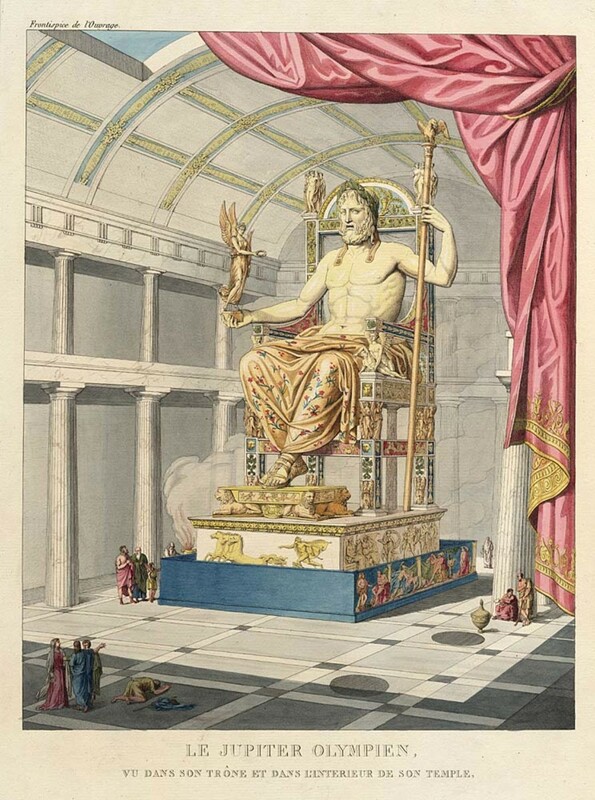 Salt was a substance so vital that it transcended tribal rivalries, and prior to the arrival of the white man was taken freely by all people in the region. When Anglo-saxon culture replaced the Spaniards a little more than two centuries after the final exodus of the pueblo dwellers, corporations and conglomerates broke sacred tradition by laying exclusive claim to this salt and exploiting it for personal profit. Nonetheless, there were areas on the salt flats that were used by the local homesteaders for the gathering of the substance that, while perhaps not revered as sacred, was nonetheless highly valued as an item fundamental to their own health and to that of their livestock. Somewhere among my family heirlooms is a black and white photo of my Great Grandfather loading up a wagon with salt at the Estancia salt flats to take back to his farm. All people everywhere, at all times in our history, depended upon these once cherished granules that nanny politicians fighting for a thinner America now denounce as kid killers. This then, is a rough sketch of how humans of many different tribes, native and European, have been struggling to survive in the region of the Salinas Missions Pueblos for at least a thousand years, and probably longer. Changes in climate, changes in environment and changes in culture affected each of these tribes and eventually made farming in this rugged, inhospitable region an untenable process. 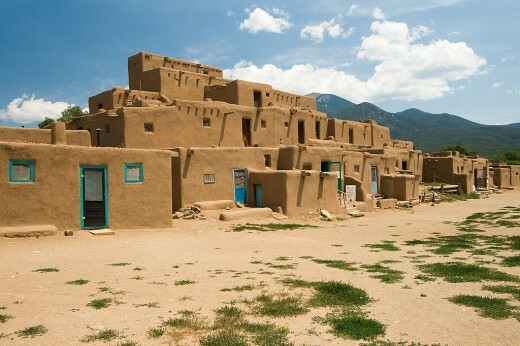 The Natives of the Pueblos were driven from their multi-storied settlements by a combination of drought, the Spaniards, and the Apache; a tribe that had once been on friendly terms with the pueblo dwellers but became enemies when the Spanish took them prisoner to work in the silver mines in Northern Mexico. The Spaniards and the mission dwelling puebloans became linked in the mind of the Apache, and the wrath of this nomadic tribe was unleashed in savage raids against all southwestern settlements that would continue for another 200 years. The inhabitants of the Salinas Missions Pueblos fled into the more hospitable Rio Grande Valley, where they found sanctuary among pueblo peoples already established there. The descendants of the Tiwa speaking refugees of Quarai are found still living today in the Isleta Pueblo, some 13 miles south of Albuquerque. They still speak of their ancestral "red house," a reference to the red sandstone bricks with which Quarai was constructed. My own tribe also fled its homesteads in the severe drought of the late 1940s, following the path blazed by the Tiwa into the Rio Grande Valley, where many among my family found refuge working urban occupations in the city of Albuquerque. Subsequent generations have scattered to the four points of the compass; a sampling of family members including residents of Phoenix, Washington State, Texas, Oklahoma, Alabama, Maryland, and of course your humble author, who resides in Chula Vista, California. The culture of the people of the United States moved on from farming to industry, then from industry to service sector jobs, and my family's culture has followed suit. 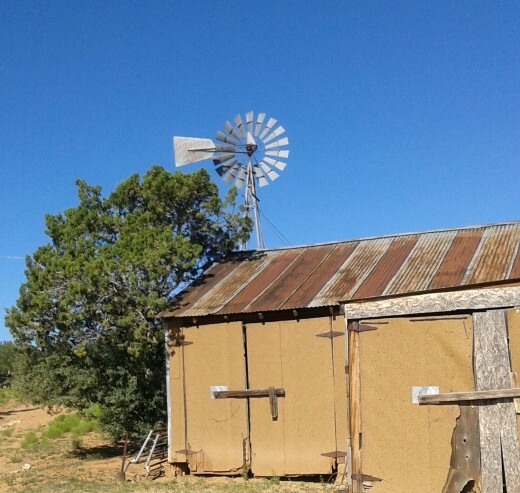 Although various stubborn members of our clan returned to the arid homesteads to try to scratch out a few beans and raise a few cattle, small scale farming is no longer cost effective in this era of corporate agribusiness, and these half hearted efforts have never gone much beyond a nostalgic passtime. The family's land is still there, although the old farmhouse and surrounding fields now serve mostly as a campground for family reunions. Alas, this purpose also appears to be coming to a sad, but perhaps necessary end. A retired uncle of mine still lives on the property, but he is moving closer to family in Texas and will probably put the property up for sale. A small registered graveyard will be the only remnant of nearly a century of habitation. These graves will remain in the shadows of the ancient cities as a testament to the surprising success and eventual failure of all the people who have tried to make a living on this unforgiving land; a place that bears either blessing or bust, and very little in between. The Rain Gods and the Salt Gods continue to alternately offer their bounty or withdraw their favor from these dry meadows, but the families originating from across the globe who once farmed these desolate hillsides have moved on to places where love and life about the hearth can be maintained with less sweat, toil, worry and sacrifice. 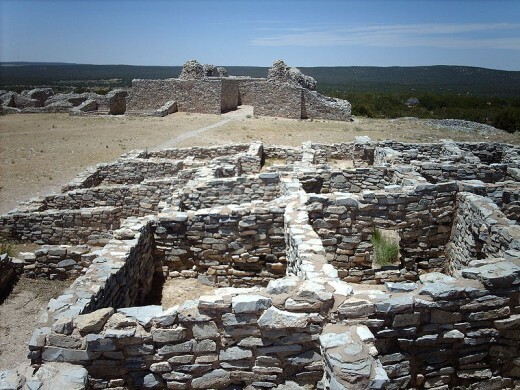 Would you consider a visit to the Salinas Pueblo Missions National Monument? The Rock Motel at 901 US Highway 60, Mountainair, NM 87036 has excellent, clean, modern, economical accommodations and is a great staging area for your Ancient Cities adventure. The Ancient Cities cafe, across the street from the Rock Motel at 511 W Highway 60 has wonderful breakfasts as well as outstanding Mexican food, standard American fare and pretty darn good pizza you can order to take back to your room. If you enjoy a nightcap after a hard day of ruin combing, bring your own booze. Decades ago Mountainair had the reputation of having more saloons per capita than any place in the US, but the town is now as dry as the gyp water wells. The few stores and gas stations that exist in Mountainair do not sell beer or wine, and the closest source is Estancia, 24 miles away. The rooms at the Rock Motel have refrigerators for your convenience if you like a cold one. Thank you Kappygirl I am glad you enjoyed it and I hope we can keep in touch here on Hub Pages. Nell it just goes to show you how we are all intricately connected all over the planet, regardless of how many thousands of miles may separate us. It really is a small world, after all. Thanks for reading and for the nice words. Thank you Lawrence. I hope you get a chance to visit sometime. But check the weather report, recent rains have left it green but the area is not much fun dry. I loved this mix of family story and history. Thank you Deb. This land is heavily covered with Pinyon-Juniper scrub, and many farmers cant resist the temptation of selling this off for firewood. In a drought prone area I cringe to think what kind of dust bowl could occur with nothing holding down the soil. Well, I see that Oklahoma was not the only area affected by the Dust Bowl. Thanks for chronicling the highlights of your family history, and putting together an important piece of history for all to learn from. History always repeats itself in drought, especially when land is mistreated. Why do we repeat our mistakes? Thank you Linda. My homeland is not as picturesque as the lushness of your Pacific Northwest, but it does have a certain barren beauty to it. Thanks for reading! Thanks for an informative hub, Mel. I enjoyed learning about the area and reading about your family. The photos are very interesting. Thank you Bill. I actually pitched this idea to New Mexico magazine but they said they had just recently done an article on the subject so I salvaged it on Hub Pages. I'm not much a travel article guy myself, so I tried to throw some personal tidbits in to hopefully give it life. Thank you Larry Rankin I'm glad you liked it. Yes, it seems when I write I am always trying to intertwine two or more things that are only remotely connected, now that you bring it up. As we used to say in the navy, if you can't sway them with logic baffle them with BS. Your visits are always a pleasure. Dana Tate I think awkward is a better word, not boredom. Think of it as research. As a writer you are going to hear some stories you can file away for future reference. Thanks for dropping by! I don't read many travel articles but you managed to make this one very interesting. You tossed in some family history, some site history, and some great photos. Any way you look at it, this was a pleasurable read. Love the way you intertwined your family reunion with your description of the pueblos. Looks just beautiful. I've seen pictures of such places, but I've never had the opportunity to visit one. My family reunion is on the 15th of July and I dreaded going. These are the relatives of my maternal grandmother and I was thinking "Oh boy, three days of boredom with people I don't know. After reading your hub I feel more in the spirit. After all, blood ties run deep. Thank you for putting things in perspective. These are my family members after all, and tomorrow is not promised to any of us. Yes Eric green is precious and should be cherished regardless how ugly. I don't understand what the women folk have against weeds. My wife tells me to spray the dandelions. I told her I won't do it because they are Goldfinch food. She sprayed them, but they are still there. Resilient little buggers. Thanks for reading and the entertaining comment. Thank you Oztinato for dropping by. Well I reckon that if more of us So. Cal. folks had grown up in our great arid Southwest New Mexico territory we would all have a finer appreciation for that water we so unabashedly waste around here. My wife who basically grew up in cleared delta land told me to pull up the "weeds". I told her that "hell they are green and they are growing that makes them cherishable". This was a wonderful read and a nice reminder to me where my roots are from, or should I say lack of roots are from? Some nice images here. Interesting stuff.